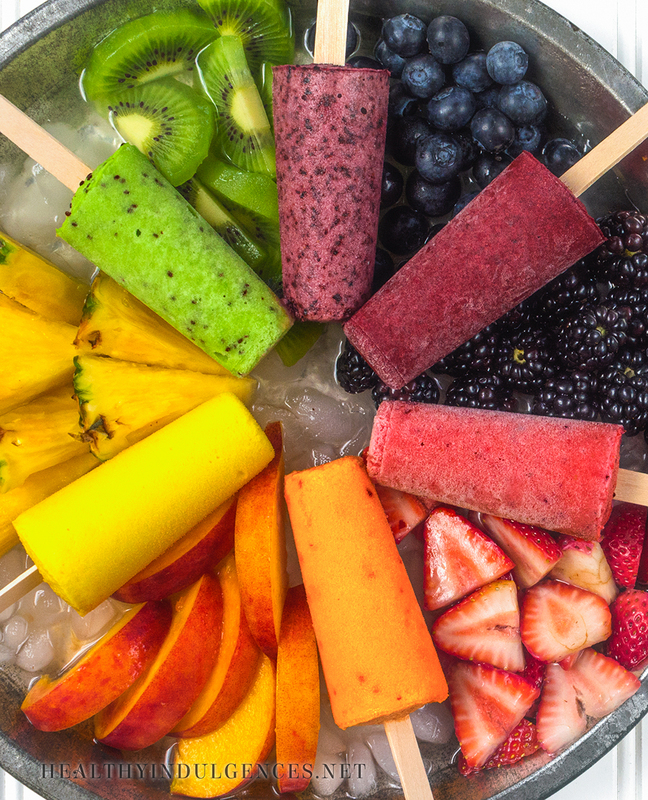 Most homemade fruit bars are made with juice, which freezes so hard you could crack a tooth on it. To get the same fluffy, bite-able texture as packaged fruit bars, I froze the fruit before blending it to make a popsicle “slush” that I scooped into the molds. The air bubbles created by pulsing frozen fruit into a slush mix is what keeps the bars from freezing rock solid, kind of like how an ice cream maker aerates the ice cream to make it scoopable. A small amount of vegetable glycerin also helps keep the bars soft since it lowers the freezing point. What’s glycerin, you ask? It’s a long chain carbohydrate that is processed as a complex carb. The tiny amount used in this recipe contributes a negligible amount of carbs, so I’d recommend using it. You can leave glycerin out, but the texture of homemade frozen treats is dramatically improved with it. Learn more about glycerin and to where to buy it here. If you don’t want to use glycerin, just use honey in its place. The bars will not be quite as soft with the honey, but the flavor will be sweet enough. Because these pops are made of whole fruit, they’re much lower in sugar than packaged bars. They’re not, however, completely sugar-free. The great thing about sugar in whole fruit is that the body processes it differently since it’s bound up with fiber, antioxidants and other beneficial compounds. While the sugar in fruit will cause your insulin to rise just as much as any other type of sugar, it’s more difficult to overeat whole fruit than it is to consume sugar in other forms. You’d have to eat 3 apples to rival the amount of sugar in a coke. 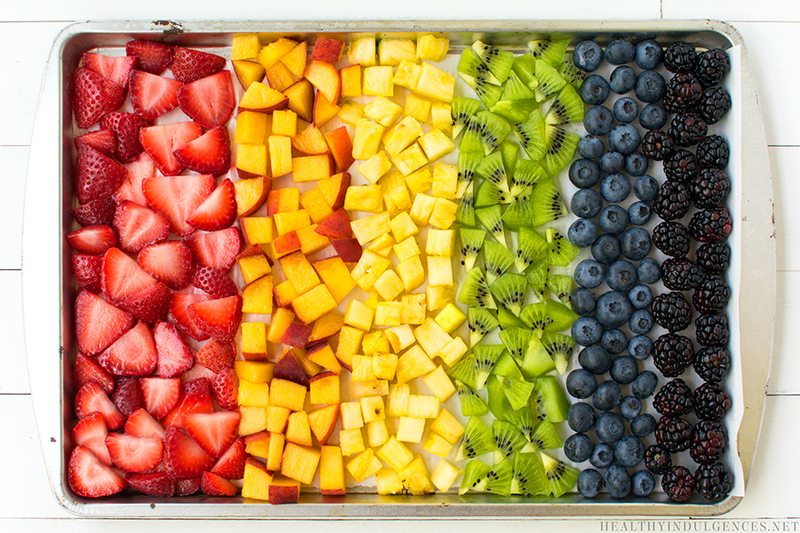 Fruits—especially the red and blue ones—contain anthocyanins. These powerful antioxidants are linked to increased heart health and improved memory. Who couldn’t use more of that? (A year spent in medical school will teach you the value of retaining every brain cell if nothing else will.). I picked up the mold seen below at a kitchen outlet store for $2. Check your local outlet stores, or even the dollar store, to find reasonably priced molds. Get creative with layering! In light of recent events, we could all use a bit more color and brightness in our lives. 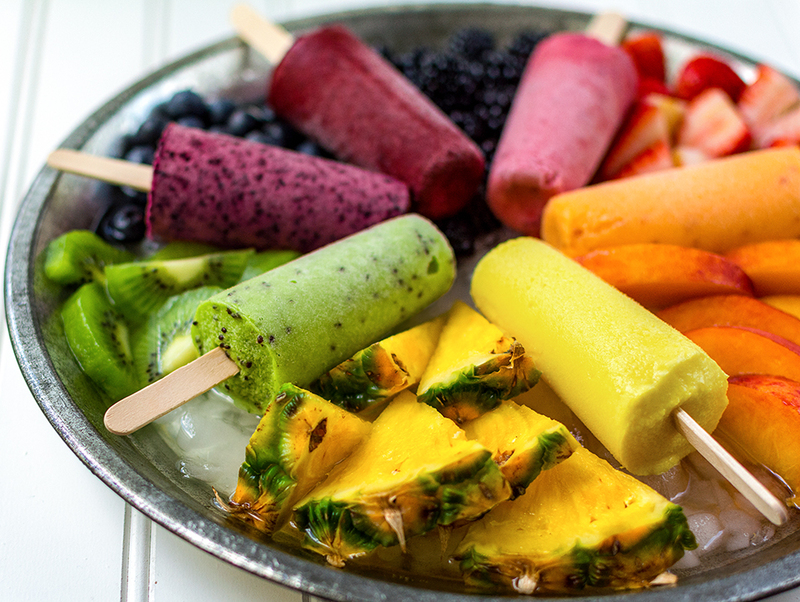 These technicolor rainbow pops look too pretty to eat, but I assure you it it’s much more fun to eat them than it is to stare at them. There may have been a few curse words muttered as I attempted to neatly fill the molds without intermixing the various colors. To maximize ease and minimize frustration, I recommend making just 2 or 3 layers. You could even dip these bars in 70% chocolate, because why wouldn’t you? Cut fruit chunks into small pieces (1/2”) and freeze on a parchment-lined cookie sheet overnight, or until solid. 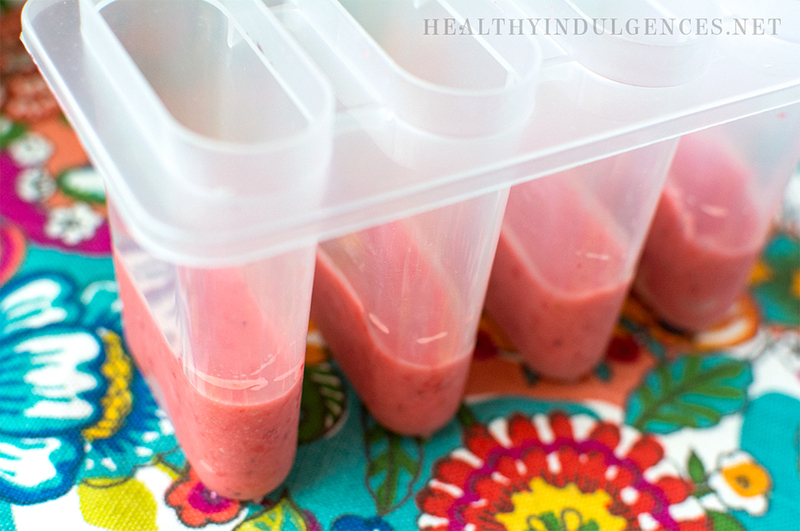 Measure out fruit chunks using a scale. 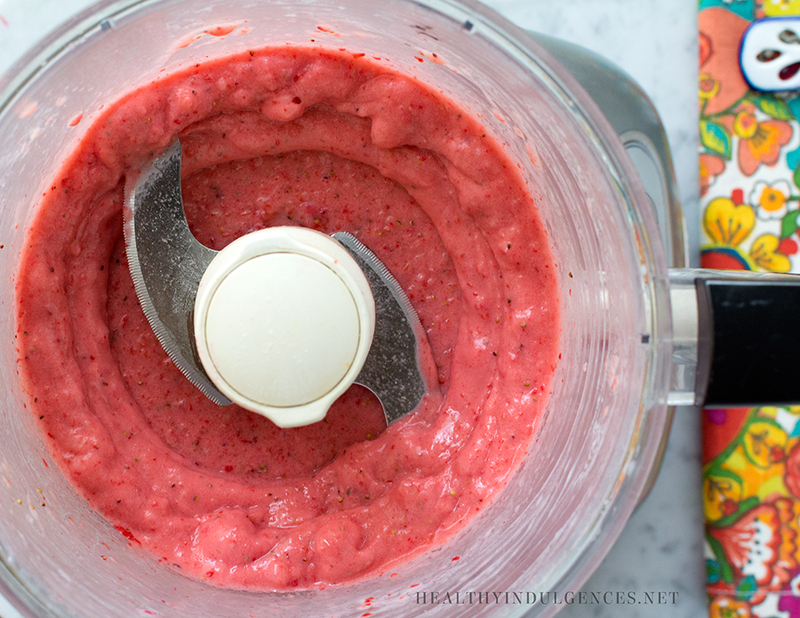 Working quickly, add fruit chunks to food processor. Add the rest of the ingredients. Pulse fruit in food processor until it forms slushie-like texture. Using a small spatula, scrape slushie mix out of processor into a ziptop baggie. Cut the corner off and pipe mix into popsicle molds. These popsicle molds are my current favorite, but you can pick up molds for a better price from Wal-Mart, or even the dollar store. 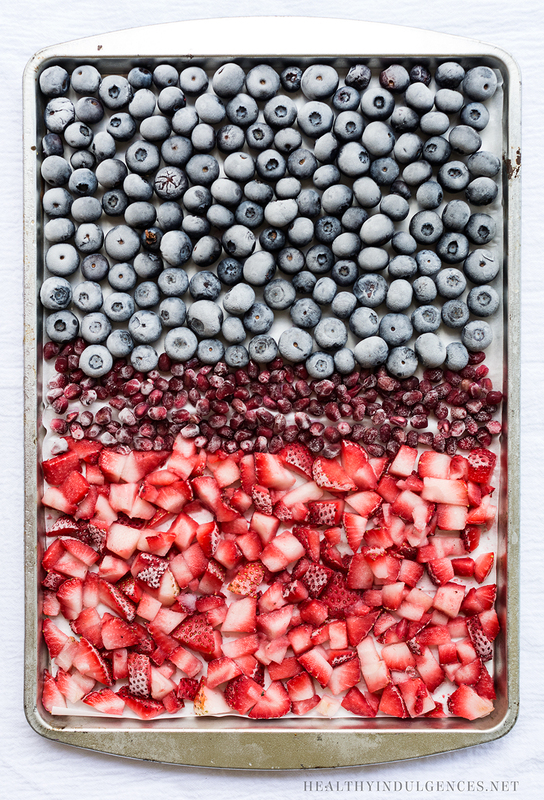 To make multi-layered fruit bars, freeze various types of cut up fruit on one cookie sheet. 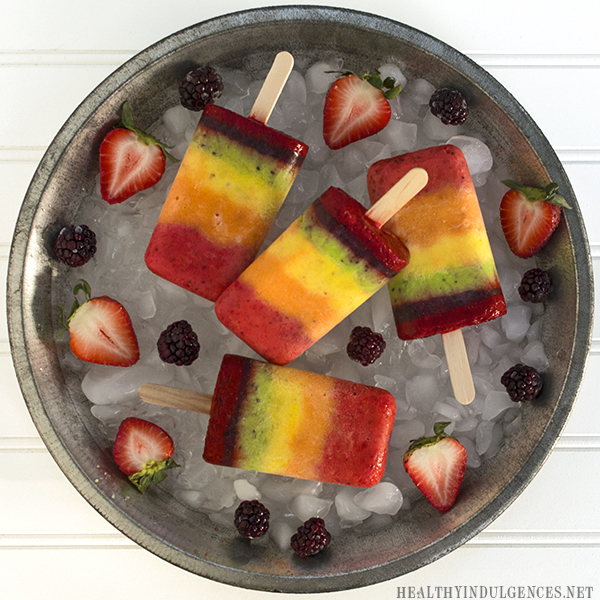 Create each fruit layer individually, sticking the popsicle mold back into the freezer as you prep the next layer. Don’t stress if the layers don’t look perfect. They’ll still taste divine! The first change I made that ended up leading me down this path, was cutting out Coke and other soda pop. (full sugar, that diet stuff was nasty.) I’d made it through 18 weeks of chemo, and it tasted metallic due to the treatments. Ginger ale tasted better, so that helped during the rough times. Afterward when I was feeling better, I decided that I should cut out all that corn syrup, and went cold turkey! (Thank you, McDonalds, for having iced tea!!!) Then I noticed I had lost about 12 pounds in a year from just doing that. So I looked into low-carb/low-glycemic diets, read Good Calories, Bad Calories, found your blog, and the rest is history. Lori, thanks for your comment. Sounds like you’ve had quite the health journey, and I appreciate you sharing a bit of it here. Soda is such a beast! So many around here drink it. Good to know that tea can be a suitable stand-in. Did you sweeten it with a sugar-free sweetener, or just drink it unsweetened? Reading food labels can be so eye-opening. We’re going to hold a class in the community about label reading, so it’s great you hear you found it to be a helpful exercise! I use liquid Splenda to sweeten my hot & iced tea, Sucra Drops and EZ Sweetz. I feel like Kombucha is a great soda substitute. It still has the bubbly-ness to it and it’s really healthy for us. I was part of a group several years ago that visited a new diabetes learning center in our area. The doctor brought out this very large test tube (I had never seen one that big) filled to the top with sugar and told us that that was how much sugar was in 1 can of soda. I gave up sodas after seeing that. These look delicious! I love the natural ingredients and no added sugar. Wouldn’t it be great to come up with a Bragg’s Apple Cider popsicle recipe that tasted good? That stuff is very healthy and I drink it everyday before going to bed, it’s great for lots of things including weight loss! !